The CD Learning Combo now comes with a FREE One-to-one Mentoring Package for schools comprised of 2 headsets. Get all you need in one go and see your students' speaking skills improve session after session. This CD Player with iPad connection is a great little transportable unit ideal where a compact CD player with built-in speakers is required. It has USB and SD card slots and you can connect and amplify a tablet, smartphone or laptop. The strong metal case will protect the unit so that you can enjoy using it for many years. With built in stereo loudspeakers and eight headphone sockets it can double as both a class room playback machine and a discreet listening centre for small groups. This is model 44372-R1. Use the class facing stereo speakers to amplify playback of the CD. Listen to story books through up to 8 headphones. Alternatively, 2 of the sockets can be used with headsets. This allows the teacher and pupil to converse discretely and without ambient noise distractions. Learning music can be helped with the ability to play and slow down the audio. The unit is battery powered and can charge any USB device such as iPad, tablet, etc. The battery is also used to power the unit so it can be very portable and safe to use without trailing cables. It can be used outdoors for story times under a tree! Connect and amplify tablets or laptops in class, or turn them into listening centres. The robust buttons & knobs are cleanly labelled for use by children of all ages. Simple to use and provides excellent results everytime.The simple controls offers adjustment of balance and volume, the CD functions are also available through the remote control such as repeat track and play/pause features. Versatile tool that amplifies with clarity and controlled power. Learning languages can be enhanced by clearly comprehending spoken words. Compact, strong, safe, easy to transport, easy to set up and use by anyone, anywhere. The 44372 is a very simple to use CD player, suitable for many applications. Features based on requests from teachers to help with a growing demand for the ability to have one to ones with pupils but having difficulty finding quiet space in school to do this. Pupils respond better in an environment where they feel safe and have the confidence and encouragement to speak out without being criticised. Pupils with low esteem or lack of confidence hold back when they think they are being overheard by peers. They don't want other children to hear them speak as they are afraid of making mistakes and being made fun of. By practising speaking with someone they trust and who is mentoring them they soon gain more confidence to speak freely in most situations. 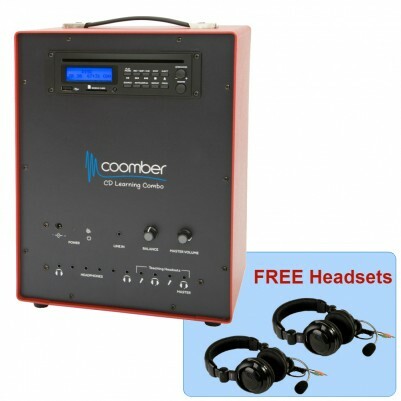 This CD Learning Combo comes with 2 built-in headset sockets. Using the headsets allows the teacher and pupil to converse discretely and without ambient noise distractions, even in a noisy environment just like a normal classroom. Using the headsets they allow even the slightest of the audible sounds of the teacher and pupil to be heard clearly and precisely without straining. This same process can be used to assist reading, by listening to the pupil read aloud immediate and positive guidance can be given boosting their vocabulary and confidence.